Andrew Kreps Gallery is pleased to announce its second exhibition with Los Angeles based artist Barbara T. Smith. Since the 1960s, Smith’s work has demonstrated an engagement with issues of spirituality, gender, and power, making vital contributions to both feminist discourse, and the history of West Coast performance art. The works in this exhibition focus on her early use of technology and her engagement with the scientific community. 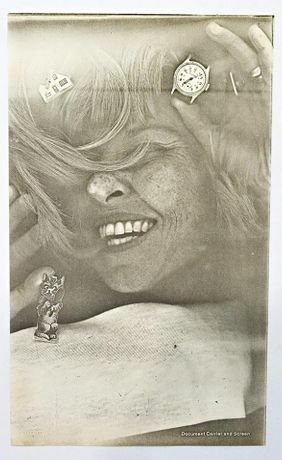 Smith’s pioneering Xerox work is the earliest series in the exhibition dating from 1965 to 1967, and reflects a pivotal moment in the trajectory of her life and practice. Initially intending to make lithographic prints, Smith discovered the then-new technology of the Xerox copy machine, a mass-printing device that she perceived to be the future of printmaking. Smith leased a 914 Xerox Machine, at the time only in use by large corporations, and feverishly experimented with, among other things, images of her children taken by the artist-photographer Jerry McMillan. Simultaneously, Smith discovered her body as a performative tool by placing it upon the machine. Obsessively repeated and layered, the resulting works form a preemptive, and melancholic reflection on the loss of her family in her subsequent 1968 divorce. Following this, Smith fully devoted her life to art-making, with works that reflected a similar engagement with a burgeoning community of artists in Los Angeles, as well as an exploration of the new relationship between performance artworks and their audience. At the exhibition’s core is the documentation of three seminal performance works, demonstrating Smith’s contribution to the history of the medium. The earliest, titled the Longest Day of Night was performed at Smith’s studio in Pasadena in December 1973 and coincided with the Winter Solstice. Staged in honor of the approaching comet Kahoutek, those invited were greeted by blazing airplane lights, and escorted up a staircase by a maître d’ in a rhinestone-studded tuxedo. Encompassing all senses, the performance included an ambient audio piece, dramatic light effects produced by Tesla coils, shadow dancing, as well as a multi-course meal comprised of food the color of night – i.e. caviar, black beans, and licorice ice cream. Throughout, experiments with light and dark, and the resulting contrasts, tied the work to cosmic issues of being, and non-being. At dawn, participants drive in the snow to the top of Mount Wilson Observatory to witness the arrival of the comet. Scan 1, 1974 and Outside Chance, 1975 both continue to reflect Smith’s ongoing engagement with technology. In Scan 1, which took place at the Woman’s Building in Los Angeles, Smith invited 2 groups of people to participate, one to be performers and the other observers. The forty performers were shrouded in hoods with brightly painted tongues and mouths, faced a television monitor showing commercials. At cues embedded within the commercials, the performers would enact sets of choreographed, oral gesticulations that mirrored the scan operations of current television technology. This created a challenge for the observing group to attempt to decipher the codes embedded in the commercials that triggered the actions of the performers. For Outside Chance, Smith collaborated with Richard Rubenstein, a friend and computer scientist to create a series of 3000 unique, computer-generated prints of snowflakes, printed on continuous form paper. Smith carried these to the 21st floor of Las Vegas’ Plaza Hotel in a suitcase, wearing a wig and a film noir inspired outfit. Releasing them from a balcony onto the street, they fell to the ground like snow in the desert.